VASS TOWNSHIP, North Carolina (WTVD) -- Moore County residents begging for a fix to Woodlake Dam sustained another setback on Wednesday, as the engineering firm working for the dam owners terminated the contract. Geosyntec, an international firm with field offices in Raleigh, was originally hired by Woodlake's owner Illya Steiner to work closely with state officials to fix the maligned dam that nearly failed during Hurricane Matthew. The heroic efforts of the National Guard to sandbag the dam and save hundreds of homes downstream was one of the lasting images from the historic storm. Geosyntec terminated the contract after dam owners failed to make a $270,000 payment. Officials with the North Carolina Department of Environmental Quality confirmed Geosyntec's move to cut ties with Woodlake. The breakdown almost guarantees the dam will remain broken, fully empowering the state to enforce its many dam safety orders and citations issued to Woodlake during the past several years. The last DSO, issued on November 17, mandated that the Woodlake must have had its engineers begin work on a temporary breach of the dam begin by December 8 and be completed by December 31, 2016. Additionally, the DSO gave the dam owners 91 days from the order's issue for engineers to submit complete plans for the repair of the dam. According to the DSO, had the conditions not been met, the owners would face fines of up to $500 a day. A spokesperson for the NC Department of Environmental Quality (DEQ) told ABC11 that Woodlake was given five days from December 8 to provide a written response to the DEQ with an update on their plans and work. Internal memos shown to the I-Team revealed even Geosyntec had yet to hear from Woodlake owner Steiner, or its manager, Julie Watson. State officials say the case has been passed on to the Office of General Counsel, the first step in taking legal action against Woodlake. An ABC11 I-Team investigation revealed a history of negligence on the part of the owners - German investors Ingolf Boex and Steiner - and a failure on the part of the DEQ to enforce the many DSOs and notices delivered during the past decade. 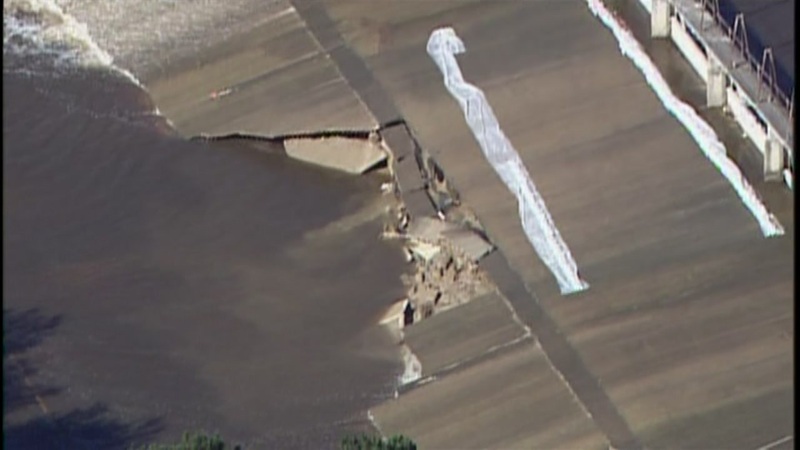 RELATED: WHO'S RESPONSIBLE FOR WOODLAKE DAM FAILURE? Hurricane Matthew exposed the dangers of that neglect when crews found a ruptured spillway, forcing the evacuation of hundreds of residents. The National Guard was called in a frenzy to plug the leak with sandbags. As the I-Team also reported, the risk of impending breach forced the DEQ and FEMA to bring in pumps to drain the lake and reduce pressure on the failing dam. The result has been the disappearance of Woodlake, which was a desired spot for waterfront properties. The lake was once home to fish, frogs, flora, fauna and many species of birds. The Woodlake owner and managers have ignored repeated requests for comment. "The safety of Woodlake Country Club residents, members, guests and our surrounding neighbors is our top priority...The interim remedy is intended to rapidly improve the protectiveness of the dam until a final remedy is designed, permitted, and implemented. The final remedy process will require ongoing collaboration with the state regulators until a final solution is in place. We want to emphasize that throughout this process the protection of human safety and the environment are our top priorities." Despite several requests, McDonald would not answer any questions about the latest DSO or Woodlake's noncompliance. Are Woodlake Dam owners ignoring state agency?